It's another insanely busy week in this wintry burg clinging to the coast of Lake Michigan, so no substantive post (yet again), but simply a link to a very comprehensive review of Mongoose's RuneQuest II at RPG.net. This time, simply a link to a review of the Advanced Edition Characters supplement for the Labyrinth Lord game (the 'Basic/Expert' D&D 'retro-clone'). I'm still working my way through Mongoose's RuneQuest II corebook (only up to chapter 2 so far in my 'careful' and 'comprehensive' reading of the rules, but I've skimmed/read bits from the other chapters as well). However, I recently came across this very positive review of MRQII on 'teh intraweb', and recommend it to anyone interested in this version of the classic game. The descriptions of the different dungeon elements are brief yet inspiring. The charts are delightful, and will almost certainly serve as a catalyst to future creative adventure design. After a quick survey, my favourite chart is the one for 'Books,' with the one for 'Weird' a close second. 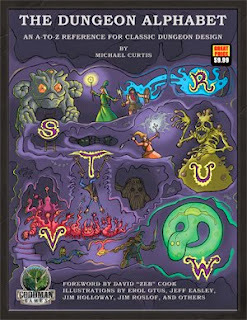 The author has a 'round up' of links concerning The Dungeon Alphabet here. And a full review can be found over at 'Grognardia' here. 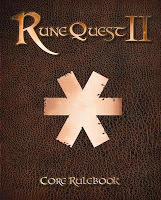 My copy of Mongoose's RuneQuest II (MRQII) finally arrived today, and I am very favourably impressed. The book looks beautiful. I love the simplicity of the cover. The interior layout is clean, and the art is consistently quite good (even the 'cheesecake' pics aren't that bad). I'm not a huge fan of the recent trend towards 'full colour' RPG books, and I'm glad that MRQII opted for a crisp 'black and white' look, sans shiny pages, wide margins, and so forth. At first glance, the rules look straightforward and interesting. I'm not a huge fan of hit locations, but I'll have to read through how precisely they work in MRQII before making a final judgement. The other material looks very cool and promising. I'm really looking forward to reading this, and comparing it my favourite 'd100'/'BRP' fantasy role-playing systems, OpenQuest and Elric!. Eventually I'll post my impressions here. Advanced Edition Companion for Labyrinth Lord now available! As most of you no doubt already know, the retro-clone Labyrinth Lord recreates the rules of 'Moldvay/Cook' classic D&D (the version of Basic & Expert D&D with the Erol Otus covers, from 1980-81). 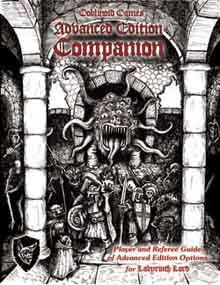 Now available is a 'Companion' book that expands Labyrinth Lord to include the options that were made available in 1e Advanced D&D, i.e., additional races and classes. All of these additional options, however, are presented in a manner fully compatible with the core Labyrinth Lord rules (unlike 1e AD&D, which was a similar but nonetheless distinct game from Basic/Expert D&D). Well, it certainly looks pretty and, um, familiar, doesn't it, gentle readers? However, it looks like the D&D 'Essentials' box set will be yet another pointless 'starter kit' from Wizards of the Coast. It will only cover characters up to level 2 (and not 5, as was my initial impression). So, just like the 3e, 3.5e, and earlier 4e 'starter kits', we have a piece of 'crippleware', essentially an expensive piece of advertising, not a true game. Consequently, I have abandoned all interest in this product. Now I realize that the Holmes, Moldvay, and Menzter Basic D&D Sets all went up to only level 3, and 3 is only one number higher than 2. However, character progression was much slower in earlier D&D than it is in 4e. 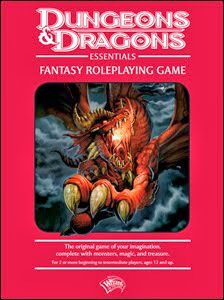 Consequently, one could run a campaign of 6+ full adventures before characters reached level 3. Indeed, my summer Swords & Wizardry campaign lasted a few months, and at the end of it the highest level PCs were only level 3. In contrast, in 4e characters progress far more quickly. So there might be something like 10 'encounters' before the resources of this box set are exhausted. Meh. In short, I should've known better than to have been intrigued by this product. Turns out it's just more shiny rubbish. Long before the 'retro-clones' emerged and the 'Old School Renaissance' existed there was a cool little fanzine for an out-of-print RPG. The RPG in question was 'Classic' (i.e., 'Basic' or 'BECMI' or 'Rules Cyclopedia') D&D, and the fanzine was 'OD&Dities' (the term 'OD&D' was, and still is, often used to refer to 'Classic/Basic' D&D, rather than the 1974 '0e' version of the game -- confusing, I know, but not a big deal, given the overwhelming similarity between the two systems). Now, after 7 years, 'Methuslah' (a.k.a. Richard Tongue), the force behind OD&Dities, is starting the fanzine up again, and will be producing it on a monthly basis! The full scoop can be found at Methuslah's new blog 'OD&Dities.' If you would like to catch up on the first 12 issues of OD&Dities, they are available for free at dragonsfoot here (just scroll down). I highly recommend them. This is excellent news for all fans of Ye Olde Game!